The site of a World War Two searchlight battery and associated type 22 pillbox are visible on aerial photographs to the north of Hase’s Lane, Lyng. The pillbox still survives on the ground and is located to the immediate north of the road. Common type 22 pill box standing on a hill 120m north of the road, facing southwest. The pillbox dates to 1940. Information from . See record form in file. The pillbox is actually at the corrected grid reference and is on the road verge, not 120m north as stated. The description is otherwise accurate. The loopholes have been bricked up and it is in use as a farm store. The blast wall is intact. At the previous incorrect grid reference (TG 0881 1723) RAF air photography 1946 (S1) shows a circular feature in rough ground. This is now ploughed over and is a circular pit. E. Rose (NLA), 29 November 2002. 1946 RAF air photography (S1) appears also to show a number of earthworks and buildings, giving the appearance of a more extensive military site than that described above. The circular pit described above, along with several mounds give the appearance of gun emplacements, or possibly a searchlight battery. M. Horlock (NLA), 29 November 2002. The central grid reference of the site has been altered from TG 08817 17244 to TG 0886 1716. The site of a World War Two searchlight battery and associated type 22 pillbox are visible on aerial photographs to the north of Hase’s Lane, Lyng (S1). The site is centred on TG 0886 1716. A large circular ditch surrounding a sub-circular mound located at TG 0886 1715, probably represent the remains of the searchlight emplacement. This is linked by a trench or track to a small embanked structure or emplacement to the northwest and this is likely to have housed the predictor. A circular embanked gun pit is located to the west of this. 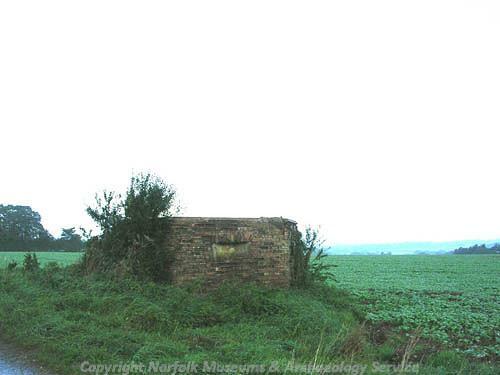 The type 22 pillbox is located on the roadside to the southwest of the site at TG 0881 1711 and this still survives. The rest of the site has been levelled. S. Massey (NMP), 19 December 2007. <S1> Vertical Aerial Photograph: RAF. 1946. RAF 3G/TUD/UK/51 5070-1 31-JAN-1946 (NHER TG 0817A, TG 0917A).